Background: With the advent of new interim crown materials, it has become imperative to evaluate its strength in order to select the appropriate interim crown and partial fixed dental prosthesis material. Aim: The purpose of this in vitro study was to compare marginal adaptation, wear resistance, and fracture resistance of a computer-aided design/computer-aided manufacturing (CAD/CAM) versus a dual polymerized interim fixed dental prosthesis (FDP). Materials and Methods: Twenty models were randomly allocated into two equal groups (I and II). Group (I) received 10 CAD/CAM fabricated interim FDP (CAD-Temp) and Group (II) received 10 directly fabricated interim FDP using a dual polymerized material (TempSpan). All specimens were stored before testing. Marginal adaptation was tested using stereomicroscope and image analyzing software to measure the amount of marginal gap. For wear resistance test, all specimens were subjected to mechanical tooth brushing. Stereomicroscope and image analyzing software were used to measure the difference in height before and after tooth brushing. Specimens were subjected to cyclic loading; specimens intact from defects were then loaded to fracture. Data were analyzed using Student's T- test, Mann Whitney test and Fisher exact test (α = 0.05). Results: CAD-Temp (15.026 ± 4.340 μm) showed significantly higher marginal adaptation than TempSpan (145.418 ± 25.365μm)(P < 0.001). The wear resistance of CAD-Temp (7.3322 ± 0.99853 μm) was significantly higher than TempSpan (22.3165 ± 2.35459 μm) (P < 0.001). The fracture resistance of CAD-Temp (605.1 ± 31.718N) was also significantly higher than that of TempSpan (225.76 ± 32.469N) (P < 0.001). Conclusions: CAD/CAM fabricated interim restorations have better marginal adaptation, wear resistance and fracture resistance than dual polymerized interim restorations hence, might withstand longer duration in the oral cavity. Traditionally provisional restorations were fabricated using either PMMA or bisphenol a glycidylmethacylate (Bis_GMA), and there is literature available on the relative strengths and abrasion resistance of these materials. ,,,, With the advent of new interim materials, it has become necessary to evaluate their strength in order to select the appropriate interim crown and fixed dental prosthesis (FDP) material. The purpose of this in vitro study was to compare the marginal adaptation, wear resistance, and fracture resistance of interim prostheses prepared using CAD/CAM versus one prepared using a dual polymerized interim fixed dental prosthesis. The study used CAD/CAM blocks (Temp Blocks (CT- 40); VITA-Zahnfabrik; Germany) and a dual polymerized material (TempSpan; Pentron Clinical Technologies, USA). Master die was prepared on a student model with interchangeable hard resin teeth: lower right first premolar (#44) and first molar (#46) were prepared for ceramometal crown design. Three points were engraved by a cutting disk below the facial, lingual, and proximal (mesial of premolar and distal of molar) finish line of the prepared molar and premolar. These points acted as standard reference points. The lower right second premolar (#45) was removed and the socket was blocked and shaped by wax to resemble an edentulous space. A reusable mold of the prepared segment was made from addition cure duplicating silicon. Twenty replicas of the right segment of the model carrying the prepared molar and premolar were made, from metal filled epoxy resin, by the manufacturer. The constructed specimens were then randomly divided into two groups of ten specimens each according to the interim material used. 0CEREC MC XL systems (Sirona dental system; USA) with Sirona's 3D (V 3.01) software was used to design and mill 10 interim FDP made from CAD-Temp blocks. Optical impression for each specimen was captured. CEREC 3D software then transformed the optical data for each preparation into an accurate three-dimensional digital model. A fully anatomical three unit interim FDP restoration design using the 3D software was done. Finally, 10 CAD-Temp blocks were clamped in milling chamber of CEREC 3 machine (Sirona dental system) and milled successively. After milling (CAM), the lug was cut off using a fine cross-cut tungsten carbide bur. The interim FDPs were polished with a silicone polisher and a small goat-hair brush according to the manufacturer instructions and seated on their respective models. Negative reproductions of the milled interim FDP was obtained with a silicon rubber base impression material (Virtual; Ivoclarvivadent; Schaan, Germany) held in a quadrant tray. The silicon molds were used to make ten standardized interim FDPs according to the manufacturer instructions. Crowns with internal or external voids, visible cracks and those that did not adapt to the die on all surfaces were excluded from the study. A new brush (Oral B Procter and Gamble; Weybridge, UK) was used for every specimen. The experimental units were aligned so that the brushing head moved parallel to their occlusal surface. A current dentifrice containing abrasives of aluminum hydroxide (Colgate Fluor guard Colgate-Palmolive; UEGE, Italy) was used as abrasive slurry with a paste-to-water ratio of 1:1. A vertical load of 350 g  on the top of each brush, during horizontal movement was applied on each specimen throughout the test, to ensure equal loading between the brushes and the specimens. After testing, specimens were removed from the machine, rinsed with tap water, cleaned in distilled water for 5 minutes, and gently air dried. The vertical distance between the cusp tip and the horizontal line was measured again under the stereomicroscope after the mechanical brushing. The amount of wear was the difference between the vertical distance before and after brushing. The vertical difference from each cusp was compiled and the average of the six cusps was calculated for each specimen. Finally, an overall average of vertical loss formation was calculated for each test group. All the 20 interim FDPs were cemented on their respective dies using temporary eugenol-free luting cement (Provilat; Promedica; Neumünster, Germany). All the procedures were carried out according to the manufacturer's recommendations and by the same operator. The cyclic loading was performed using a custom made load cycling machine (Dental Biomaterial Department; Alexandria University). Cyclic loads in this study corresponded to 3 months of clinical service. , Accordingly, samples were exposed to 60,000 mechanical cycles [Figure 1]. The specimens were examined stereomicroscopically to evaluate the nature of failure if failure occurred. Specimens that failed during cyclic loading were excluded and only those that were intact from each group were subjected to fracture test. Statistical analysis was performed using statistical package for social sciences program Statistical Package for the Social Sciences (SPSS 17.01) software. The study included descriptive and analytical data. A P value <0.05 was considered statistically significant. Data were presented as means and standard error (SE) values. Results of marginal adaptation and fracture resistance were analyzed using Student's T-test. The results of wear resistance were analyzed using Mann-Whitney test for comparison between unpaired signed ranks test. Fisher exact test was used to analyze and compare the defects that happened following cyclic loading. The group vertical gap mean value and the standard error of both Group I (CAD-Temp) and Group II (Tempspan) are listed in [Table 1]. The mean gap difference of the two groups was compared using Student's T-test. 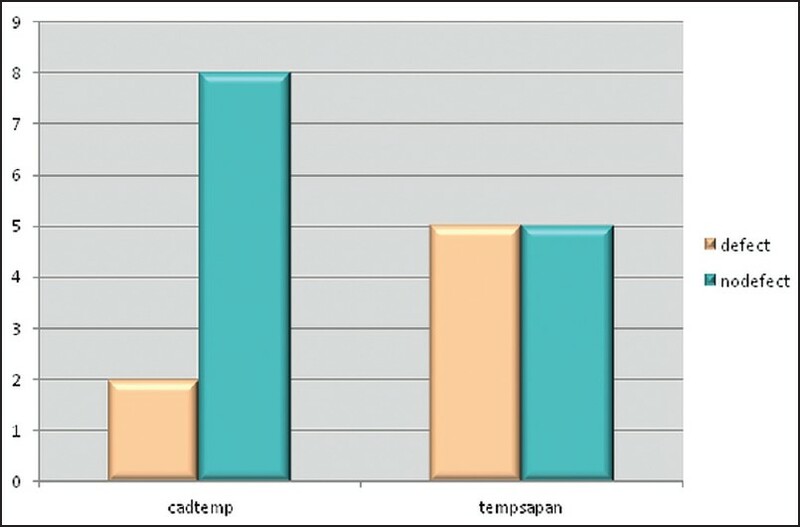 TempSpan showed significantly higher mean gap than CAD-Temp; P < 0.001 [Figure 2] and [Figure 3]. The group wear mean value and the standard error of both CAD-Temp and Tempspan are listed in [Table 2]. The wear mean difference of the two groups was compared using Mann-Whitney test (U test), for comparison between unpaired signed ranks test. CAD-Temp showed significantly higher wear resistance than TempSpan; P < 0.001 [Figure 4] and [Figure 5]. Figure 5: Wear results Group II TempSpan® (a) Before mechanical tooth-brushing and; (b) after mechanical tooth-brushing. The number of defects and the mode of failure that happened for both groups following cyclic loading are listed in [Table 3]. Fisher exact test was used to compare the difference in defective specimens between the two groups. There was no statistically significant difference between the two groups in number of defective specimens. P = 0.350 [Table 4], [Figure 6] and [Figure 7]. The group fracture load mean and standard error of both CAD-Temp and TempSpan are listed in [Table 5]. Student's T-test was used to compare the fracture load mean between the two groups. CAD-Temp showed significantly higher fracture resistance than TempSpan P < 0.001 [Figure 8]. Due to the continued growth of the implant market, the demand for interim crown and FDP materials for implant cases has been constantly rising. This applies mainly to materials suitable for the fabrication of long-term temporaries. Evaluation of the mechanical properties of interim fixed dental prosthesis materials is important to prevent failure of a temporary restoration from the beginning, after fabrication and insertion. Therefore, this in vitro study compared the marginal adaptation, wear resistance, load bearing capacity, and fracture strength and Group I (CAD-Temp) CAD/CAM provisional block versus Group II (TempSpan) dual-polymerized interim material. In this study, the null hypothesis that there was no difference in marginal adaptation, wear resistance, and fracture resistance between CAD/CAM and dual polymerized interim fixed dental prosthesis can be rejected. Interim fixed dental prosthesis fabricated from TempSpan, dual polymerized interim material, showed significantly higher marginal discrepancy than those fabricated from CAD-Temp, the CAD/CAM provisional blocks; P < 0.001. The vertical gap mean value of CAD-Temp was 15.026 ± 4.340 μm. The low mean gap exhibited by CAD-Temp might be because the CAD/CAM blocks material as claimed by the manufacturer had homogeneity, high-molecular and cross-linked acrylate polymer with microparticle filler. It might also be because they were previously industrially polymerized under optimized conditions hence no further polymerization shrinkage is expected to happen. The vertical mean gap value of Tempspan was 145.418 ± 25.365 μm. This high value may be due to the polymerization shrinkage exhibited by the material. Kim and Watts  mentioned that the net magnitude of polymerization shrinkage strain depends upon number of factors, such as the type of monomer, the amount of monomer, the volume fraction of filler particles, filler size, the degree of conversion, the nature of the resin, stiffness and flow of resin, the rate of polymerization, curing characteristics, water sorption, and the intensity of the light used to polymerize the resin. This increased marginal discrepancy demonstrated was in agreement with Givens et al. who tested the marginal adaptation of a dual polymerized material and reported that there was high marginal discrepancy of the dual polymerized material (319 μm). They suggested that the majority of gap formations occurred during the auto-polymerization phase of polymerization of dual polymerized material. When comparing wear resistance of the two groups, interim FDP fabricated from CAD-Temp had statistically significant higher wear resistance than those of TempSpan; P < 0.001. Although toothbrush abrasion testing is influenced by factors such as the type of testing device, loading, number of strokes, toothbrush type, and dentifrice type,  these parameters were standardized for both groups for better evaluation of the effect of tooth brush abrasion on the characteristics of the tested restorative materials. CAD-Temp mean wear value was 7.3322 ± 0.99853 μm. This high-wear resistance might be because the material was industrially produced in which better material homogeneity was provided hence fillers were well distributed. Furthermore, the high-molecular and cross-linked acrylate polymer with microparticle filler  in this material provided a strong bond between filler particles, more stability of the resin matrix thus less dislodgment of filler particles and equal size of filler particles. This is in agreement with Zeng et al. who observed under scanning electron microscopy (SEM) that composite resin material with size of fillers that varied greatly and weak filler bond had low wear resistance and they suggested that to improve wear resistance chemical structure of the matrix network had to be enhanced, the quantity of fillers using well-distributed fillers of a similar size should be increased and, and improve the connection between the matrix and filler. For TempSpan, the mean wear value was 22.3165 ± 2.35459 μm. This low-wear resistance might be because the material as described by its manufacturer  have three different types of filler particles: barium, glass, silica, and alumina with different sizes, amounts, and distribution. Tanoue et al., and Teixeira et al., reported that both resin matrix and filler particle type or content were thought to affect surface conditions after toothbrushing owing to the selective abrasion of the resin matrix and the dislodgment of filler particles after long-term exposure. Furthermore, some of the properties affecting wear resistance of composite resins include size and distribution of filler particles, percentage of surface area occupied by the filler particles, filler-matrix interactions, and degree of polymerization. Furthermore in Tempspan, surface irregularities were observed under the stereomicroscope after brushing, in addition to the higher amount of wear demonstrated by the material. This could be caused by the leaching of filler particles during toothbrushing, and then acting as abrasive particles once detached from the surface. According to the criteria and parameters of Krejci et al.,, the applied load cycles in this study were equivalent to 3 months of clinical service. Accordingly, samples were exposed to 60,000 cyclic loads with 40 N force and 1.7 Hz to resemble 3 month of clinical aging. Evaluation of the effect of cyclic loading in this study showed three types of defects under stereomicroscope: fracture, chipping, and cracks. CAD-Temp showed two specimens with defects following cyclic loading. In this group, only cracks and marginal chipping were observed in two specimens. In both specimens, the one with crack and the one with marginal chipping, the defects were noticed at the same place, at the proximal wall of the first premolar crown 2,683 um away from the margin. This site is the exact site of the lug attachment after milling of the interim FDP, these defects might have happened due to weakening of that wall during either cutting or finishing of the lug. Kim S and Watts DC  reported that clinically marginal breakdown of the restorations happened at a distances of 0.4-1.0 mm away from the edge, thus the distance of 2.683 mm (2683 um) is by far from the reported distance of clinical marginal breakdown. Defective specimens (chipped, cracked, or fractured) following cyclic loading were excluded. Only intact specimens from CAD-Temp n = 8 and from TempSpan n = 5 were subjected to fracture test. The fracture load values of CAD-Temp (605.1N ± 31.718 N) were almost within the range of a previous study done by Wanner  who compared the mechanical properties of three provisional blocks CAD-Temp, Telio CAD, and artBloc Temp. But the results obtained in this study were almost double that obtained by Stawarczyk et al.,  (288.9 ± 30.2N) who compared machine-made temporary (artBloc and CAD-Temp) to direct restorations and the egg shell temporaries. The lower values may have resulted from the different method used for testing. CAD-Temp showed significantly higher fracture resistance than TempSpan, P < 0.001. There could be two reasons for this: one of them is technique dependent and the other is material dependent. As for technique, chair-side fabrication of interim restorations is associated with some short comings affecting the mechanical strength such as mixing procedures and filling the overimpression leading to errors like incorporation of voids, compromising the mechanical strength. These human errors are eliminated in CAD/CAM technology and thus restorations produce superior results. This finding agreed with Alt et al. , who investigated the influence of fabrication technique. From the material perspective, using resin-based blanks cured under optimal conditions exhibit increased mechanical strength and prevented porosities within the restorations. In addition to this, according to their manufacturers CAD-Temp is a PMMA material  while TempSpan is a bis-GMA material  ; many studies compared the fracture resistance of provisional materials made of PMMA to those made of bis-GMA. Almost all of them confirmed that although bis-GMA materials had higher flexural resistance than PMMA materials, bis-GMA was a brittle material and its fracture resistance was lower than that of PMMA. ,, These results were in contrast with Alt et al. , who concluded that composite based materials seem to offer clear advantages versus PMMA-based materials and should, therefore, be considered for CAD/CAM fabricated temporary restorations. Diaz-Arnold et al. results who stated that bis-GMA composites are more dense, and as a result, they demonstrated high transverse strength. Within the limitations of the study, it can be stated that based on the marginal adaptation, wear resistance, and fracture resistance, the CAD-CAM based interim material is perhaps better suited to long-term interim restorations than cured resin materials. 1. Oxman JD, Anderson SE. Dental crown liner composition and methods of preparing provisional applications. Available from: http://www.patentstorm.us/patents/5709548/fulltext.html [Last accessed on 2009 Apr 10]. 2. Federick DR. The provisional fixed partial denture. J Prosthet Dent 1975;34:520-6. 3. Zinner ID, Trachtenberg DI, Miller RD. Provisional restorations in fixed partial prosthodontics. Dent Clin North Am 1989;33:355-77. 4. Driscoll CF, Woolsey G, Ferguson WM. Comparison of exothermic release during polymerization of four materials used to fabricate interim restorations. J Prosthet Dent 1991;65:504-6. 5. Kim SH, Watts DC. Polymerization shrinkage-strain kinetics of temporary crown and bridge materials. Dent Mater 2004;20:88-95. 6. Land MF, Fujimoto J, Rosenstiel SF. Contemporary fixed prosthodontics. 3 rd ed. St. Louis, Missouri: Mosby; 2001. p. 380. 7. Blum J, Weiner S, Berendsen P. Effects of thermocycling on the margins of transitional acrylic resin crowns. J Prosthet Dent 1991;65:642-6. 8. Dubois RJ, Kyriakakis P, Weiner S, Vaidyanathan TK. Effects of occlusal loading and thermocycling on the marginal gaps of light-polymerized and autopolymerized resin provisional crowns. J Prosthet Dent 1999;82:161-6. 9. Hung CM, Weiner S, Dastane A, Vaidynathan TK. Effects of thermocycling and occlusal force on the margins of provisional acrylic resin crowns. J Prosthet Dent 1993;69:573-7. 10. Zwetchkenbaum S, Weiner S, Dastane A, Vaidyanathan TK. Effects of relining on long term marginal stability of provisional crowns. J Prosthet Dent 1995;73:525-9. 11. Stawarczyk B, Trottmann A, Fischer J. Breaking load of conventionally produced versus CAD/CAM temporary bridges. Quintessenz Zahntech 2008;34:412-21. 12. Beuer F, Schweiger J, Edelhoff D. Digital dentistry: An overview of recent developments for CAD/CAM generated restorations. Br Dent J 2008;204:505-11. 13. Telio CAD. Available from: http://www.ivoclarvivadent.com/en/all/products/resin-based-veneering-cadcam-materials/cad-cam-acrylic-polymer-blocks/telio-cad [Last accessed on 2010 Sept 13]. 15. Alt V, Hannig M, Wöstmann B, Balkenhol M. Fracture strength of temporary fixed partial dentures: CAD/CAM versus directly fabricated restorations. Dent Mater 2011;27:44-51. 16. Tanoue N, Matsumura H, Atsuta M. Wear and surface roughness of current prosthetic composites after toothbrush/dentifrice abrasion. J Prosthet Dent 2000;84:93-7. 17. Yilmaz A, Baydaº S. Fracture resistance of various temporary crown materials. J Contemp Dent Pract 2007;8:44-51. 18. Fahmy NZ, Sharawi A. Effect of two methods of reinforcement on the fracture strength of interim fixed partial dentures. J Prosthodont 2009;18:512-20. 19. Diaz-Arnold AM, Dunne JT, Jones AH. Microhardness of provisional fixed prosthodontic materials. J Prosthet Dent 1999;82:525-8. 20. Balkenhol M, Mautner MC, Ferger P, Wöstmann B. Mechanical properties of provisional crown and bridge materials: Chemical-curing versus dual-curing systems. J Dent 2008;36:15-20. 21. Moulding MB, Loney RW, Ritsco RG. Marginal accuracy of provisional restorations fabricated by different techniques. Int J Prosthodont 1994;7:468-72. 22. Moulding MB, Loney RW, Ritsco RG. 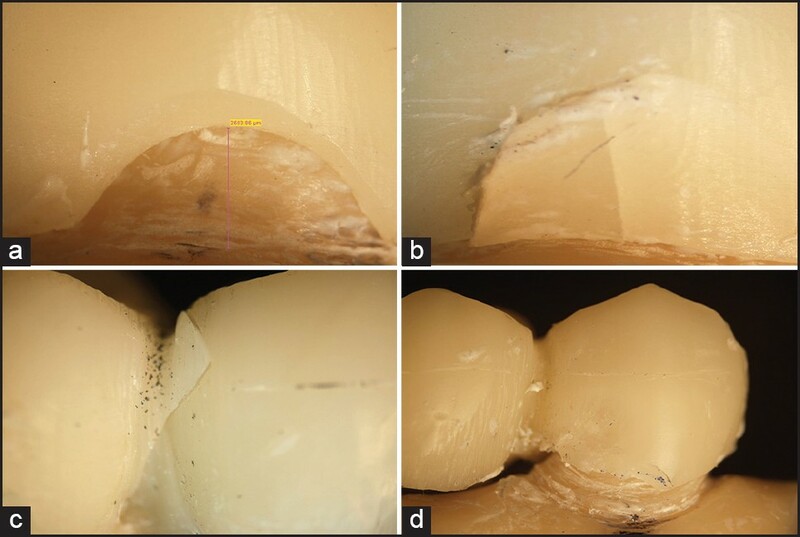 Marginal accuracy of indirect provisional restorations fabricated on poly (vinyl siloxane) models. Int J Prosthodont 1994;7:554-8. 23. Givens EJ Jr, Neiva G, Yaman P, Dennison JB. Marginal adaptation and color stability of four provisional materials. J Prosthodont 2008;17:97-101. 24. Perry R, Kugel G, Kunzelmann KH, Flessa HP, Estafan D. Composite restoration wear analysis: Conventional methods vs. three-dimensional laser digitizer. J Am Dent Assoc 2000;131:1472-7. 25. Teixeira EC, Thompson JL, Piascik JR, Thompson JY. In vitro toothbrush-dentifrice abrasion of two restorative composites. J Esthet Restor Dent 2005;17:172-82. 26. Suzuki T, Kyoizumi H, Finger WJ, Kanehira M, Endo T, Utterodt A, et al. Resistance of nanofill and nanohybrid resin composites to toothbrush abrasion with calcium carbonate slurry. Dent Mater J 2009;28:708-16. 27. Lambrechts P, Debels E, Van Landuyt K, Peumans M, Van Meerbeek B. How to simulate wear? Overview of existing methods. Dent Mater 2006;22:693-701. 28. Van der Weijden GA, Timmerman MF, Danser MM, Van der Velden U. Relationship between the plaque removal efficacy of a manual toothbrush and brushing force. J Clin Periodontol 1998;25:413-6. 29. Lang R, Rosentritt M, Behr M, Handel G. Fracture resistance of PMMA and resin matrix composite-based interim FPD materials. Int J Prosthodont 2003;16:381-4. 30. Krejci I, Reich T, Lutz F, Albertoni M. An in vitro test procedure for evaluating dental restoration systems. 1. 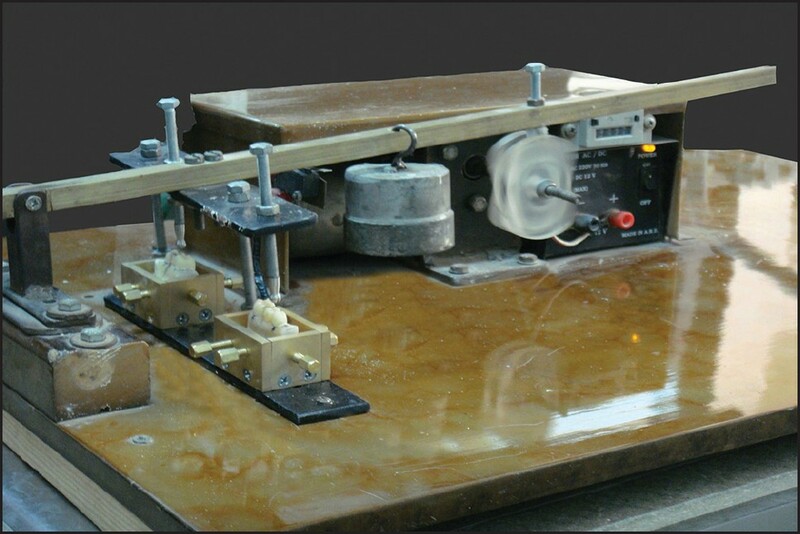 A computer-controlled mastication simulator. Schweiz Monatsschr Zahnmed 1990;100:953-60. 31. Krejci I, Albertoni M, Lutz F. An in vitro test procedure for evaluating dental restoration systems. 2. Toothbrush/toothpaste abrasion and chemical degradation. Schweiz Monatsschr Zahnmed 1990;100:1164-8. 32. Zortuk M, Ozdemir E, Aguloglu S. Evaluating the fracture strength of three different provisional crowns. J Int Dent Med Res 2010;3:25-8. 33. Balkenhola M, Fergera P, Mautnerb MC, Wöstmann B. Provisional crown and fixed partial denture materials: Mechanical properties and degree of conversion. Dent Mater 2007;23:1574-83. 34. Zeng J, Sato Y, Ohkubo C, Hosoi T. In vitro wear resistance of three types of composite resin denture teeth. J Prosthet Dent 2005;94:453-7. 35. Material safety data sheet. Available from: http://www.pentron.com/files/msds/msds_tempspan.pdf [Last accessed on 2010 Jan 29]. 36. Kim S, Watts DC. In vitro study of edge-strength of provisional polymer-based crown and fixed partial denture materials. Dent Mater 2007;23:1570-3.